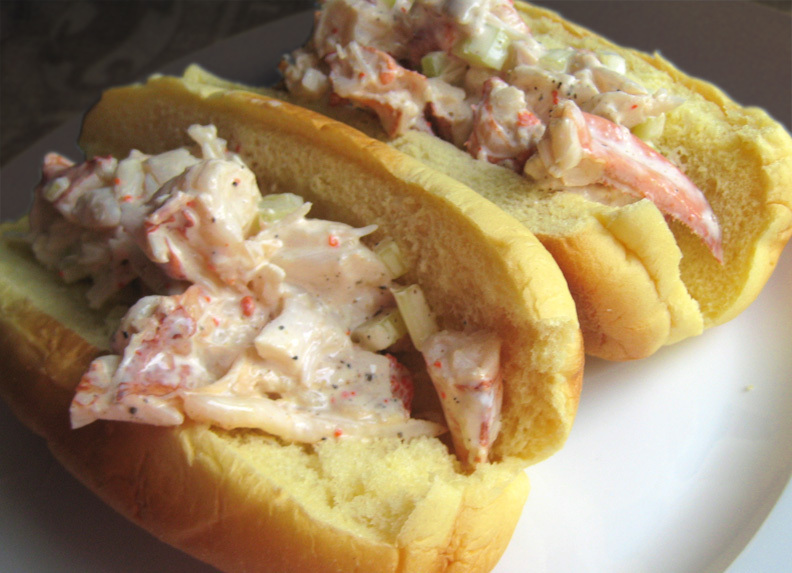 Lobster rolls are uber popular in New England, where lobster is cheap and plentiful. They're sortakinda becoming a thing way down here in Baltimore, too, where even food trucks like The Silver Platter have been serving up a traditional version. And then there's GrrChe, where the classic becomes a grilled cheese sandwich in such heretical combinations as lobster and mac & cheese or lobster and Monterey jack. The way I understand it, there are two basic schools of thought as far as lobster rolls are concerned: the salad is either mayo-based, or butter-sauced. A buttered and toasted top-split hot dog roll is the usual carrier for either version, which may or may not also include lettuce. I say as long as there's freshly steamed Maine lobster inside, it's all good. Remove the meat from the tails, claws, and knuckles and chop coarsely. Blot the meat with paper towels or drain for a few minutes in a strainer; steamed lobsters are often quite juicy, which will dilute the sauce. Toss with celery and mayo. Add lemon juice and salt and pepper to taste. Toast the hot dog buns both inside and out and glaze with a thin layer of butter. Pile in the lobster salad. Serve with potato chips.